A bad night for BIG BROTHER: CELEBRITY EDITION. 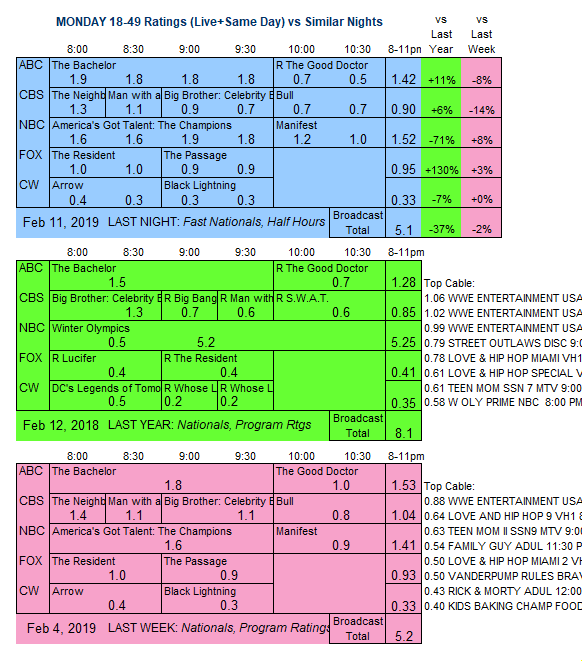 ABC: THE BACHELOR was steady at 1.8, followed by a rerun THE GOOD DOCTOR at 0.6. NBC: AMERICA’S GOT TALENT gained 0.1 to 1.7, and MANIFEST rose 0.2 to 1.1. CBS: THE NEIGHBORHOOD lost 0.1 to 1.3, and MAN WITH A PLAN held at 1.1. BIG BROTHER: CELEBRITY EDITION fell 0.3 from last Monday to 0.8. BULL slipped 0.1 to 0.7. FOX: THE RESIDENT (1.0) and THE PASSAGE (0.9) were steady. 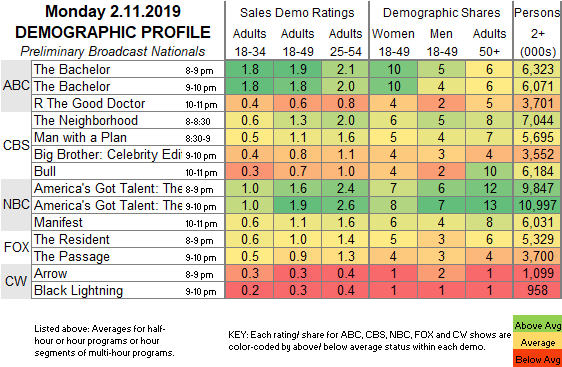 CW: ARROW dropped 0.1 to 0.3, and BLACK LIGHTNING remained at 0.3. A pair of cable comedies premiere tonight: BET’s BOOMERANG and TBS’s MIRACLE WORKERS.